Primary thallus: squamulose, persistent or disappearing; squamules: 3-6 mm long, 2-4 mm wide, irregularly crenate-lobate podetia: 2-15 (-45) mm tall, brownish green to gray, stout to more or less slender, cup-bearing; cups: 2-6 mm wide surface: ecorticate, granulose to sorediate, largely bare on old podetia; soredia: coarse, intergrading with granules and isidioid structures, sometimes forming podetial squamules Apothecia: uncommon, 2-4 mm in diam., brown ascospores: oblong, 9-17 x 3.5-4.5 micro meter Pycnidia: common, ovoid to turbinate, often constricted at base, with hyaline gelatin conidia: 5-9 x 1 micro meter Spot tests: K- or K+ dingy yellowish-brownish, C-, KC-, P+ red, UV- Secondary metabolite: fumarprotocetraric acid. Habitat and ecology: on rotten wood, tree trunks, mineral soil or humus World distribution: all continents, mainly temperate to boreal Sonoran distribution: Arizona, southern California, Baja California and Chihuahua. Notes: This species is very similar to C. pyxidata, and especially juvenile or senescent specimens can be impossible to identify with certainty. Some authors are inclined to unite C. chlorophaea and C. pyxidata, because it is difficult to make a clear-cut distinction between them, even though the presence or absence of soredia (actually granules) should distinguish the two. 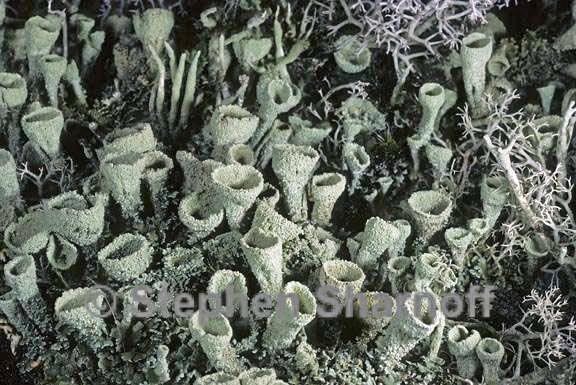 The chem.ically more variable Cladonia grayi complex  (not present in the Sonoran region) and the C. humilis complex should be recognized as distinct in any case.